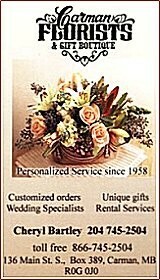 Carman Florist & Gift Boutique has been a leading full service florist in the Carman and surrounding area since 1958. 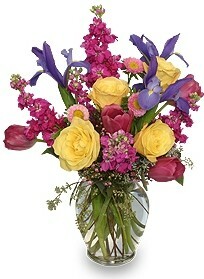 We are a Flowers Canada accredited shop and have been family-owned and operated for over 18 years. At Carman Florist & Gift Boutique, we will design all your eye-catching arrangements for sympathy, weddings, anniversary, birthday, get well, congratulations and thinking of you. Whether you prefer something time-honored and traditional or contemporary and modern, we can create a floral or gift presentation with your individual style and budget in mind. Carman Florist & Gift Boutique offers wedding equipment rentals, table linen rentals, and even tuxedo rentals. Ask about our delicious fruit and gourmet baskets... they make the perfect surprise gift any time of year. We also offer a vast selection of gift items, such as Lang® candles, tropical and green plants, Russ® plush, Ty® plush, greeting cards, home décor, silk arrangements, and fine chocolates. Along with our personalized calendars, we also offer a "Personal Reminder Service," where we automatically send flowers for all the special days you have designated. Never worry about missing an important date or occasion again! We deliver daily to all local funeral homes and hospitals and accept Visa and Master Card for your convenience. LOCAL DELIVERY IS $4.00.